I can't very well let the year end without offending as many people as possible, so here you go: Merry Christmas! Apparently it's offensive to wish someone the best. 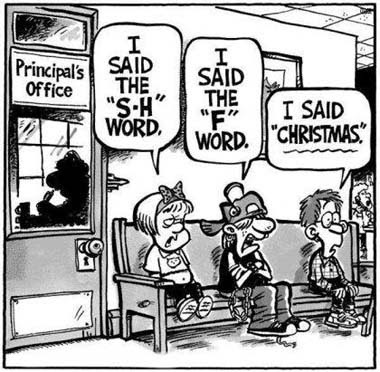 Silly me, I thought only people in southern California were allergic to well-wishing (unless they can make a buck off it), but it's beginning to look a lot like even Santa is going to get censored everywhere he goes. Why? 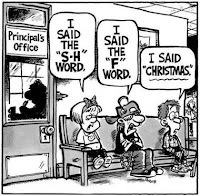 We all know what Santa's two favorite words are, and one of them will soon be struck from our Newspeak lexicon. Personally, I don't get why we're suddenly on this anti-Christian crusade. (Or is "jihad" the proper term here?) America is an inclusive place. We accept pretty much everybody here. Our Founding Fathers were largely Christian. Our government is built upon Christian values. Each of our states' Constitutions mentions God and thanks Him for existence. Why are so many people trying so hard to hide these facts? No one is forcing you to believe in God. No one is demanding you go to church. No one is going to make you have a good day if you don't want one. You are not required to accept the gift of our well-wishing. It's downright strange and anti-social, but we have plenty such people in this country, and they like to gather in remote places like Idaho and Utah. I don't recommend you join them, though, because they're liable to call you weird for not believing in God. Do you know when the last time was I got offended for being wished a Happy Hanukkah? Never! I'd probably get locked up if I did. I don't get offended about being wished a Happy Kwanzaa either. Sure, it's a made-up holiday, but aren't they all? And if someone wants me to have a Happy Ramadan, do you know what I'll do? I'll have one! And I'll be thankful they wanted to give me one. No one is telling Jews, Africans, and Muslims that they can't celebrate their holidays, so why are we attacking Christians? The modern Christmas is far more of an atheist holiday than a Christain holiday anyway. Who hasn't heard of Santa Claus? Who doesn't think it's weird if a kid doesn't believe in him? What kind of a sicko doesn't get cheery at the idea of spending hours in several stores, looking for the perfect way to spend thousands of dollars on people we hardly ever see in an effort to buy their love for a couple minutes? Irrational hate of others is one of the central reasons why atheists don't like religious people. After all, it makes no sense to be fighting over who has the better imaginery friend, right? And since atheists have an irrational hatred of religious people, guess what? That makes atheism a religion! How's that for hypocrisy? Next thing you know, they'll be tithing, in the form of a tax on gasoline or something.